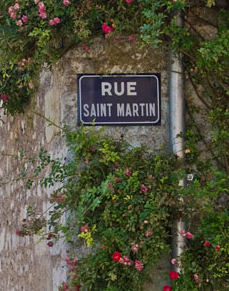 The course starts on Saturday evening at our house in the rue St Martin . . .
. . . with a welcoming aperitif and dinner . . .
. . . . and so to work! We have lunch in our garden under the vines. 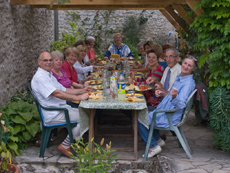 Immersion France's exciting program of French courses has been designed and tailor-made by experienced University lecturers in French in order enable adult students with an established or developing interest in French language to practise and improve their spoken and written French at the appropriate linguistic level (post-O level/GCSE to degree level) in a totally French environment. 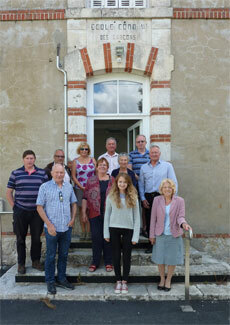 Our experienced university lecturers are sometimes supplemented by carefully chosen local French teachers. You will find more information about the teachers by clicking the link in the menu. For those of you opting to do a French Cookery course, the afternoon will be spent preparing the meal, which we will then eat together in the evening. The classes usually take place on Sundays for an additional cost of 40 euros. For more information click the link in the menu on the left. What does a typical week's timetable look like? Obviously, it may vary according to individuals' wishes, and there is always time for relaxation. Your week could look like the sample given below. You should aim to arrive between 3 and 6 pm. If you are not coming by car, we will meet you at Mer Station, a five-minute drive from Suèvres. You will be given a map and taken to your family where you will have time to unpack and settle in. At 7pm we will give you a guided tour of the village, including some of its hidden gems. 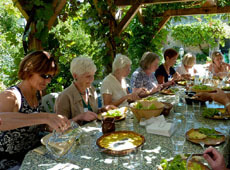 Then there will be a welcoming aperitif and meal in our garden, where invited French guests will give everyone an opportunity to take a deep breath, calm their nerves and try out their French in a relaxed social setting. 18.00 to 19.00 optional CaféPhilo, in English, with Nick. Come along and have fun learning about French philosophy - no prior knowledge assumed! 10.30 Liberation! And lifts to Mer station for those who need to catch trains.